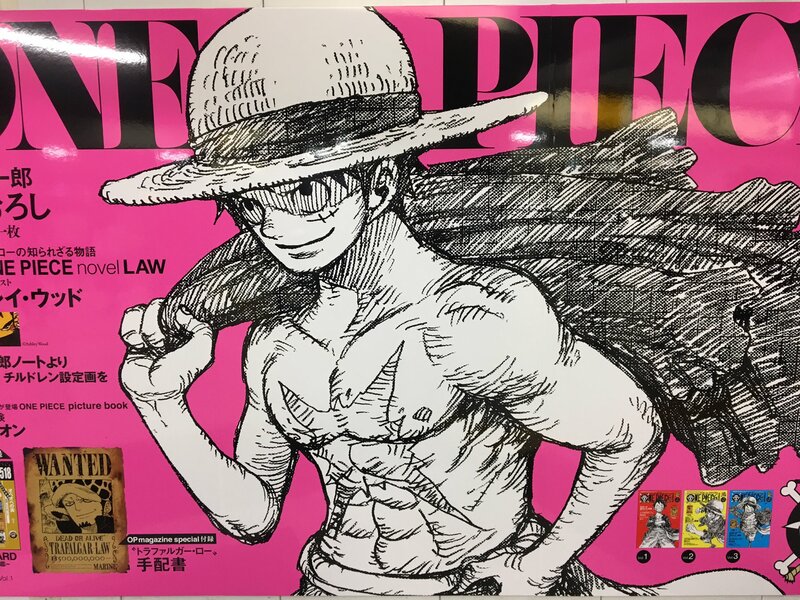 Cover "Illustration" of Law Novel by Ashley Wood ! 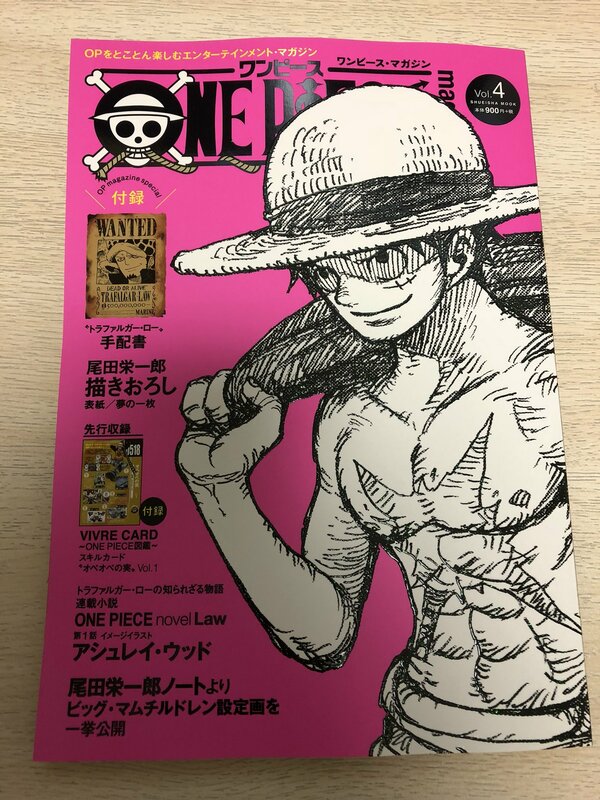 New Jump scan with more One Piece Magazine Vol. 4 information. We can see part of the Ashley Wood's illustration for Novel Law!!! Last edited by redon; October 3rd, 2018 at 01:48 PM. The Writer of Law Novel is Mr.Sakagami Akinari "Shusei" ! 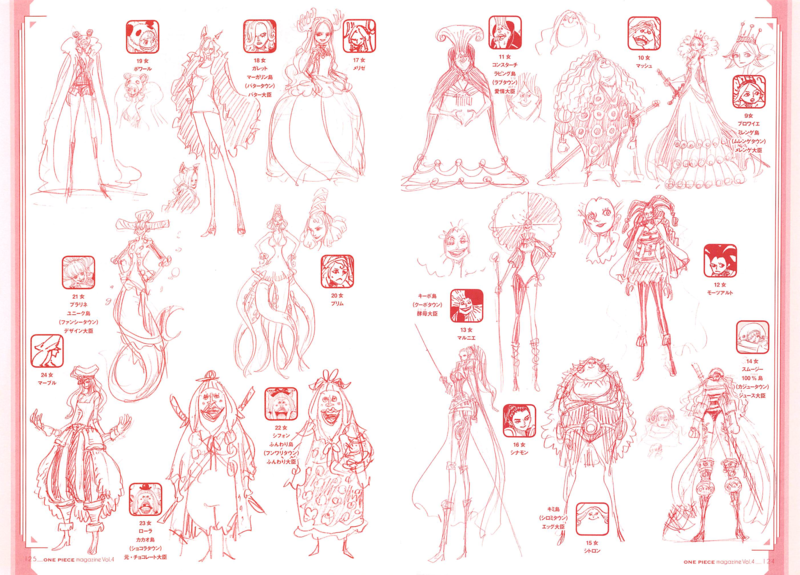 The story will be about past of heart pirates ! And law! Anyone got a list of Mr Akinari's previous works? Google on the name was inconclusive aside from a few listings for individual volumes. Wonder if all the novels they do in this style are gonna be "how fan favourite character got their crew together." 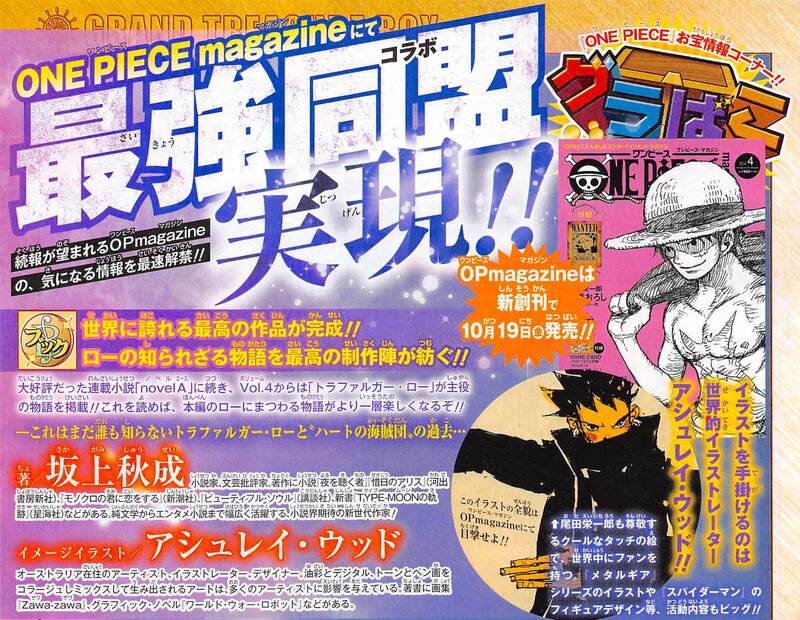 New Jump scan with more information about One Piece Magazine Vol. 4!! 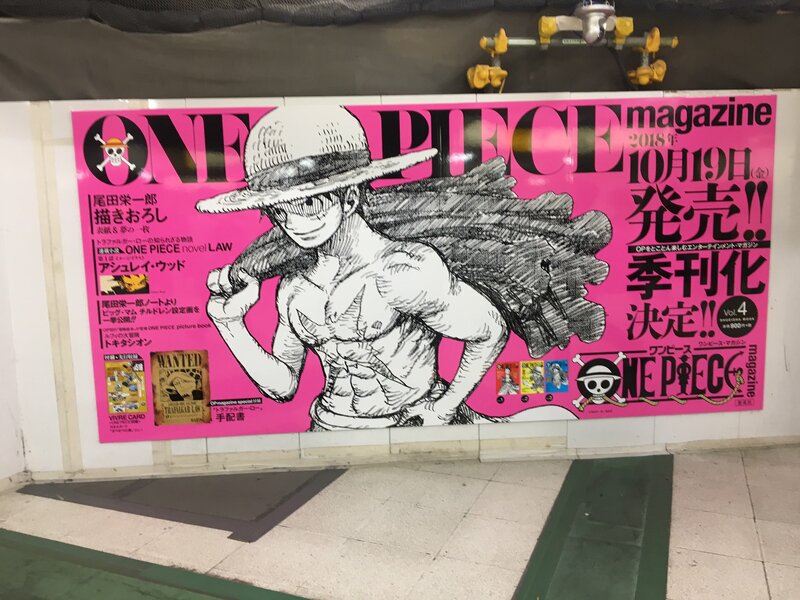 When are we supposed to have the first scans of One Piece Magazine 4? It says it will officially come out on the 19th, will we get some sneak peak earlier? Thank you! Finally, the full Charlottes list?! I would love a team of allosaurus, spinosaurus, pterodactyl, branchiosaurus, triceratops and ankylosaurus, keeping the T-Rex one for King and megalodon for Queen. Oh yes! Thank you Redon! When are we going to see those long-awaited Charlotte family new info? 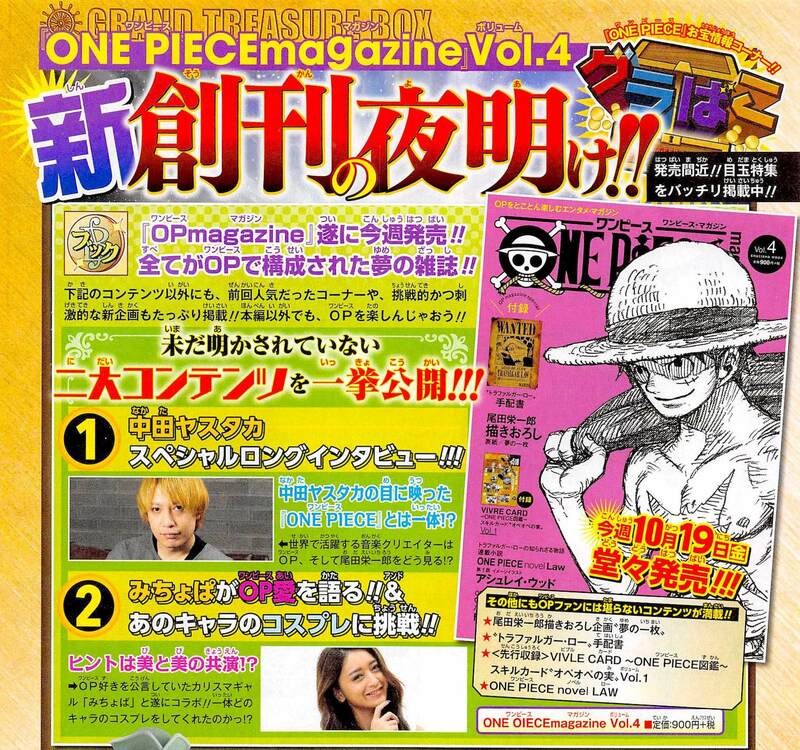 One Piece Magazine Vol. 5 will be on sale 25th January 2019!! And new Eiichiro Oda's illustration in One Piece Magazine Vol. 4!!! Merienda!!! Thanks to YonkouProductions. Big mom fucked a tontatta confirmed. I can brute force some hiragana/katakana in a while. 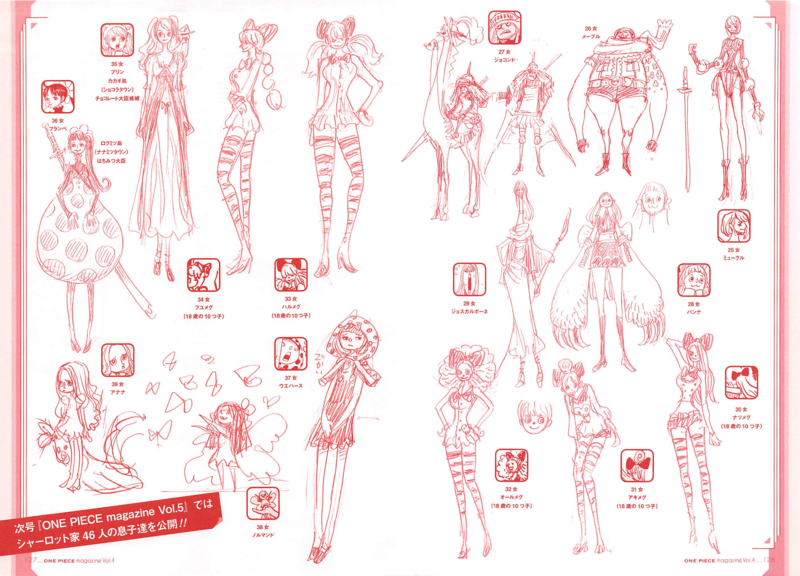 Charlotte Family female sketch in HQ, in One Piece Magazine Vol. 5 will appear male sketchs. Oh well, kind of bummed that we have to wait a while for the boys. 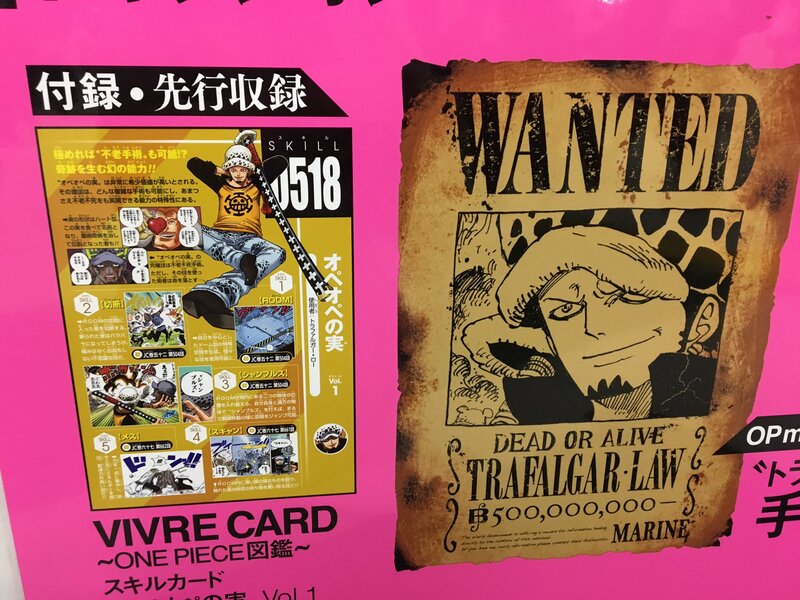 One Piece Magazine #5 is big news, especially because I love real bounties (they could sell me just those ) and now I wonder which one they'll put in it. I'd like Kid's one, to go along Law and Luffy, but they could just do Luffy's new one. First line: daugther order, Compote and Monde get a kanji, the rest numbers, second kanji is "woman". 2th Daugther: Mo n de (モンデ) Monde, world in french, may be a booze. 4th Daugther: A shi shi yu (アッシュ) Ash? Ehm:ラビング, ラブタウン Rubbing island, Love town, <kanji> minister..
(キミ) Kimi Island, (シロミ) Aroma town, (エッグ) EGG MINISTER!!! 18th Daugther: Ga re tsu to (ガレット) Galette, this one makes me thing that google translate is already compromized by one piece fans. 25th Daugther: Mu yu - ku ru (ミュークル) Myukuru, google says "Muscle"
29th Daugther: Ji yo su ka ru po - ne (ジョスカルポーネ) Joscarpone, one that doesn't make sense without her brother, and another evidence that the translator is tainted..
39th Daugther: A na na (アナナ) Anana, Pineaple in some language. Last edited by maxterdexter; October 18th, 2018 at 03:39 PM.